This book by A.S. Berman is basically a complete detailed guide to everything Soap. It is filled with facts, quotes, episode info and tons of pictures from the series. Soap was a controversial series in its time and this book deals a lot about the controversy. It was the '70s and that decade was probably the first decade where television pushed the limits with shows like Soap, Three's Company and Charlie's Angels. 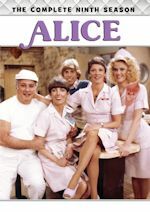 Looking back today, they kind of seem tame, but this book explains how it was like in the '70s in America and also details all the controversy on Soap. Berman's research is quite good and you'll learn a lot about what happened with the pressure groups. I didn't know nearly everything about it and Berman's section in this book did an adequate job in filling us all in. Berman then goes in much detail about each of the four seasons for the bulk of the book. I've never seen a TV show book laid out this way, but it works quite well. Each episode is outlined with lots of information and quotes. Confused? You won't be when you read these recaps. If you ever want to take notes on a TV episode, you should read Berman's episode recaps. It's great note-taking at its best. There are new interviews with the cast as well, so it makes these notes even more better. After the episode recaps, Berman gives us in-depth biographies of each cast member along with the main producers and director. It's a "where are they now" section and it's very interesting to read. Like did you know that Diana Canova (Corrine!) is now a professor at Manhattanville College? Go take her class if you live in New York! After the biographies/where are they now, there is a short section called "The Children of Soap." It's about 8 people who grew up with the show and their stories and how Soap affected them and changed their lives. It's a unique section, I think. The book ends with some acknowledgements and a nice-looking index. 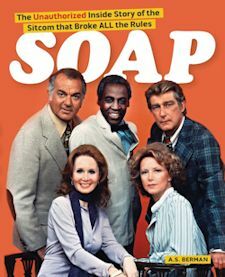 Soap was such a good show, not because it was controversial, but because the story-lines were relatable and it did what a sitcom was supposed to do -- make people laugh. The concept of a parody of a soap opera was genius. This book covers anything you could think of for Soap. The only thing that I would have added are Nielsen ratings for the original airings, only because I'm a TV nerd like that. Everything else research wise was spot on! It's hard to believe Soap premiered 37 years ago tomorrow. We timed this review perfectly, I guess. This book is in the same league as some of the top TV show books ever, which include Come and Knock on Our Door: A Hers and Hers and His Guide to Three's Company by Chris Mann. Berman gives us a 455-page cookbook of Soap. It's delicious and you'll want to keep on eating, I mean reading! Pick-up this book today because you'll want to read all this and pick-up great knowledge on Soap and hear reactions from the cast. Confused? You won't be because A.J. Berman explains nicely. For the week of Sept. 15-19, 2014, we have many current sitcom stars and past sitcom stars on TV talk shows! All times listed are Eastern. So get your DVRs (or whatever you use) ready! Ready? Here is all what you need to know for the coming week! Ike Barinholtz (The Mindy Project) - Watch Ike on Jimmy Kimmel Live! at 11:35pm on ABC. Mindy Kaling (The Mindy Project/The Office) - Mindy is a guest on The Colbert Report at 11:30pm on Comedy Central. She will also be on NBC's Today in the 10am hour. Nasim Pedrad (Mulaney) - Nasim appears on Conan at 11pm on TBS. Connie Britton (Spin City/The Fighting Fitzgeralds) - Connie visits Watch What Happens: Live at 11pm on Bravo. Justin Long (Mom/Ed) - Justin stops by Watch What Happens: Live at 11pm on Bravo. Queen Latifah (Living Single) - Queen Latifah chats on The Talk on CBS at 2pm ET/1pm CT-PT. Judith Light (Who's the Boss?/Phenom) - Judith drops by the Better Show, so check your local listings. She will also be on New York Live on WNBC in New York at 12:30pm ET. Steve Harvey (The Steve Harvey Show) - Steve dishes on taking Meredith's Ice Bucket Challenge and reveals secrets from his new book (Act Like a Success, Think Like a Success) on The Meredith Vieira Show, so check your local listings. Nathan Gamble (Hank) - Nathan talks about working with his animal co-stars in Dolphin Tale 2 on Home & Family on Hallmark Channel at 10am ET/PT. Holly Robinson Peete (Hangin' with Mr. Cooper/For Your Love) - Holly and her husband Rodney Peete are guests on SportsNation at 3pm on ESPN2. James Van Der Beek (Friends with Better Lives/Don't Trust the B---- in Apartment 23) - James will be on HuffPost Live at 1:30pm. He is also a guest on PIX11 Morning News on WPIX in New York at 7:45am. Keke Palmer (True Jackson, VP) - Keke will be on PIX11 Morning News on WPIX in New York at 8:35am. Bebe Neuwirth (Cheers/Frasier) - Bebe is a guest on HuffPost Live at 5:30pm. Kathy Griffin (Suddenly Susan) - Kathy appears on Larry King Now at 2/5pm PT/ET on Ora.tv and Hulu. Jada Pinkett-Smith (A Different World) - Jada talks about her new series Gotham on NBC's Today sometime between 7-9am and in the 10am hour. Haley Joel Osment (Thunder Alley/The Jeff Foxworthy Show) - Haley Joel is a guest on Access Hollywood Live, so check your local listings. Kevin Nealon (Weeds/Hiller and Diller/Champs) - Kevin visits Conan at 11pm on TBS. Justin Long (Mom/Ed) - Justin is a guest on @midnight on Comedy Central at midnight. Drew Carey (The Drew Carey Show/The Good Life) - Drew stops by The Talk on CBS at 2pm ET/1pm CT-PT. Zooey Deschanel (New Girl) - Zooey stops by The Ellen DeGeneres Show, so check your local listings. Tamera Mowery-Housley (Sister/Roommates) - Tamera appears on The Ellen DeGeneres Show, so check your local listings. Sherri Shepherd (Less Than Perfect/Sherri) - Sherri shares her take on the latest Hot Topics including the drama at The View, her Broadway debut in Cinderella and her own recent personal struggles on The Wendy Williams Show at 12am on BET or on your local stations. Jada Pinkett-Smith (A Different World) - Jada talks about her new series Gotham on 106 & Park at 6pm on BET. Billy Crystal (Soap) - Billy discusses his book (Still Foolin' 'Em: Where I've Been, Where I'm Going, and Where the Hell Are My Keys?) on NBC's Today sometime between 7-9am. Craig Ferguson (The Drew Carey Show) - Craig is a guest on Larry King Now at 2/5pm PT/ET on Ora.tv and Hulu. Jenny McCarthy (Two and a Half Men/Jenny) - Jenny will be on Good Day New York on WNYW-Fox5 in New York sometime between 7-10am. Max Greenfield (New Girl) - Max is a guest on Good Day New York on WNYW-Fox5 in New York sometime between 7-10am. Ty Burrell (Modern Family/Back to You/Out of Practice) - Watch Ty on Jimmy Kimmel Live! at 11:35pm on ABC. He will also be on The Ellen DeGeneres Show, so check your local listings. Michael Cera (Arrested Development) - Michal appears on a repeat of The Late Show with David Letterman at 11:35pm on CBS. Paul Reiser (Mad About You) - Paul is a guest on The Late Late Show with Craig Ferguson at 12:37am on CBS. Aimee Garcia (George Lopez/Greetings from Tucson) - Aimee visits The Late Late Show with Craig Ferguson at 12:37am on CBS. Tina Fey (30 Rock) - Tina stops by Late Night with Seth Meyers at 12:36am on NBC. Adam Pally (The Mindy Project/Happy Endings) - Adam appears on Late Night with Seth Meyers at 12:36am on NBC. He also talks about The Mindy Project on NBC's Today in the 10am hour. He will also be on New York Live on WNBC in New York at 12:30pm ET. Craig Ferguson (The Drew Carey Show) - Craig is a guest on Watch What Happens: Live at 11pm on Bravo. He also talks about Celebrity Name Game on NBC's Today in the 10am hour. Hank Azaria (The Simpsons/Free Agents) - Hank drops by The Ellen DeGeneres Show, so check your local listings. Tamera Mowery-Housley (Sister/Roommates) - Tamera and the ladies of The Real are guests on 106 & Park on BET at 6pm. Debra Messing (Will & Grace) - Debra talks about The Mysteries of Laura on NBC's Today between 7-9am and in the 10am hour. Dawn Wells (Gilligan's Island) - Dawn discusses her new book (What Would Mary Ann Do? A Guide to Life) on NBC's Today sometime between 7-9am. Cybill Shepherd (Cybill) - Cybill discusses her latest project on Home & Family on Hallmark Channel at 10am ET/PT. Neil Patrick Harris (How I Met Your Mother/Stark Raving Mad/Doogie Howser, M.D.) - Neil chats with the ladies of The View on ABC at 11am ET/10am CT-PT. Anthony Anderson (Black-ish/Guys with Kids/All About the Andersons) - Anthony appears on Jimmy Kimmel Live! at 11:35pm on ABC. Billy Crystal (Soap) - Billy stops by The Tonight Show Starring Jimmy Fallon at 11:34pm on NBC. Hank Azaria (The Simpsons/Free Agents) - Hank is a guest on Conan at 11pm on TBS. Téa Leoni (The Naked Truth/Flying Blind) - Téa talks about her new series Madam Secretary on LIVE! with Kelly and Michael, so check your listings. She will also be on CBS This Morning sometime between 7-9am. Jason Segel (How I Met Your Mother) - Jason visits The Ellen DeGeneres Show, so check your local listings. Neil Patrick Harris (How I Met Your Mother/Stark Raving Mad/Doogie Howser, M.D.) - Neil talks about his recent wedding in Italy and his return to Broadway on The Meredith Vieira Show, so check your local listings. 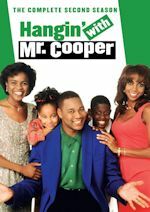 Holly Robinson Peete (Hangin' with Mr. Cooper/For Your Love) - Holly and her husband Rodney Peete discuss their latest projects on Home & Family on Hallmark Channel at 10am ET/PT. 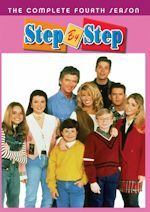 Katherine LaNasa (Three Sisters) - Katherine talks about her new series Satisfaction on Home & Family on Hallmark Channel at 10am ET/PT. Kunal Nayyar (The Big Bang Theory) - Kunal is a guest on The Queen Latifah Show on your local station or at 2am on BET. Nicole Ari Parker (Second Time Around) - Nicole and her husband Boris Kodjoe join the Chew Crew on ABC's The Chew at 1pm ET/12pm PT/CT. Michael Strahan (Brothers) - Watch Michael on a repeat of The Late Show with David Letterman at 11:35pm on CBS. Tina Fey (30 Rock) - Catch Tina on LIVE! with Kelly and Michael, so check your listings. She will also be on ABC's Good Morning America sometime between 7-9am. Neil Patrick Harris (How I Met Your Mother/Stark Raving Mad/Doogie Howser, M.D.) - Neil is a guest on Rachael Ray, so check your local listings. 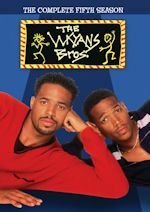 Marlon Wayans (The Wayans Bros.) - Marlon is tentatively scheduled to appear on Good Day New York on WNYW-Fox5 in New York sometime between 7-10am. Rachel Lefevre (Life on a Stick/Big Wolf on Campus) - Rachel will be on Access Hollywood Live, so check your local listings. Billy Crystal (Soap) - Billy chats with the ladies of The View on ABC at 11am ET/10am CT-PT. Dawn Wells (Gilligan's Island) - Dawn talks about her new book (What Would Mary Ann Do? A Guide to Life) on Fox & Friends on Fox News Channel at 8:52am.